It was an exciting night for Team Honda HRC as fill-in rider Jeremy Martin put together a stellar performance, leading over half of the main event before taking the checkered in second at the 46th annual Daytona Supercross by Honda. 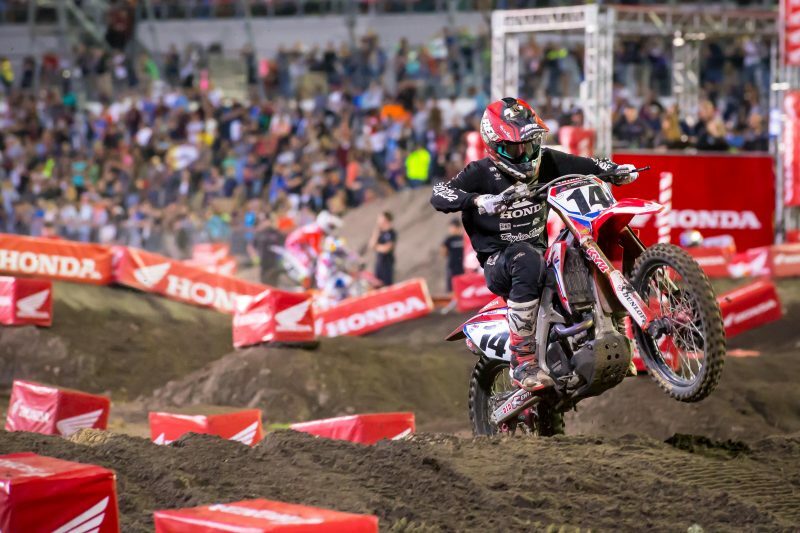 Martin who currently rides full-time for the GEICO Honda squad in the Western Regional 250SX series impressed everyone during his premier-class debut aboard a factory CRF450R. 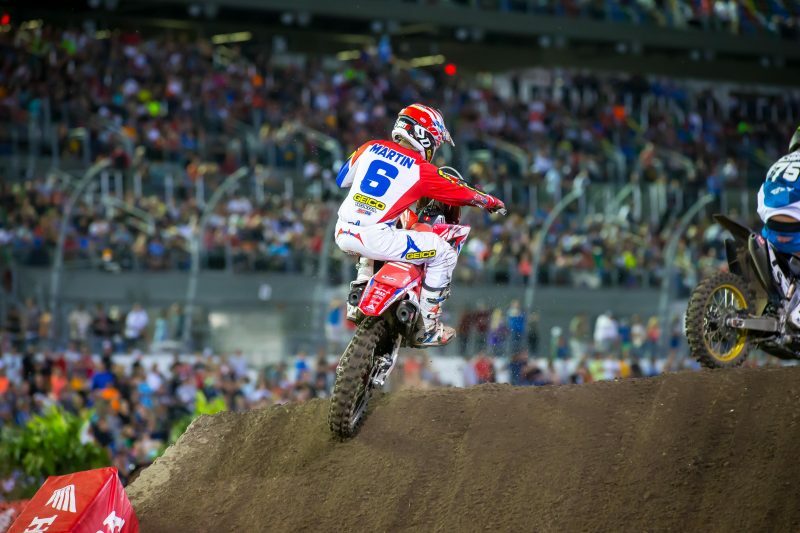 Despite having a poor gate pick, Martin launched off the line from the far outside and didn’t let off the gas until he found himself at the front of the pack. The Minnesota native held off multiple advances from the competition throughout the first 10-laps of the race before relinquishing the lead. 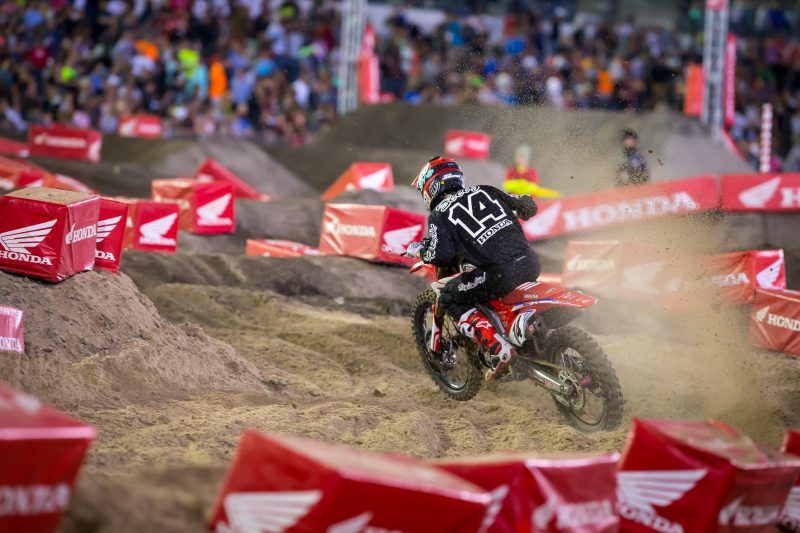 He held tough to the finish, taking the checkered nearly 10-seconds ahead of third. 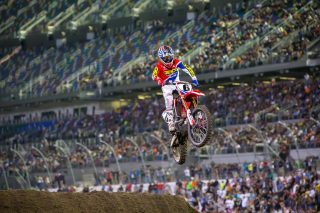 Although he wanted more, Team Honda HRC’s Cole Seely secured a solid fifth-place finish, moving him up to third in the championship standings. 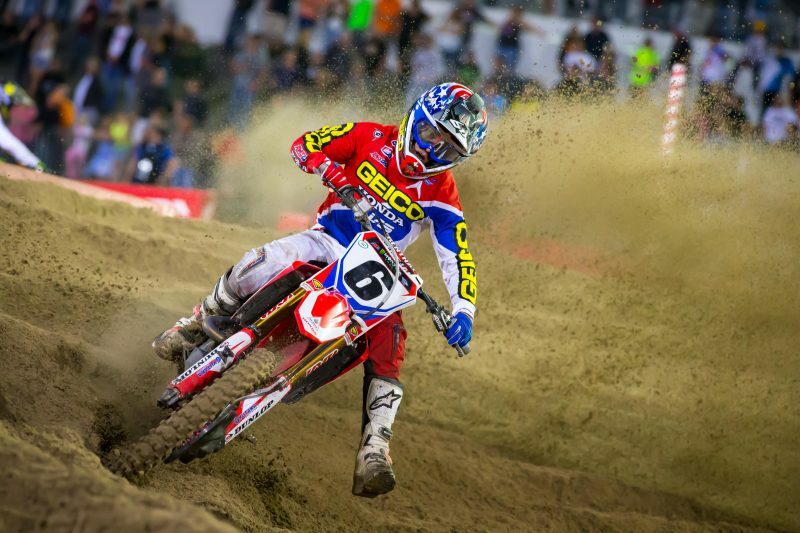 Sitting eighth after the first turn, Seely quickly maneuvered his way into sixth on the opening lap. By lap 11, he had made his way into fourth. 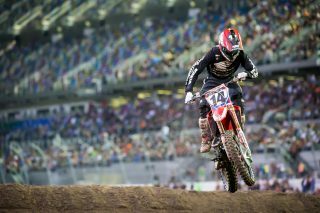 Seely came under fire on the last lap but ultimately was unable to hold off the competition, losing one spot to take the checkered in fifth. 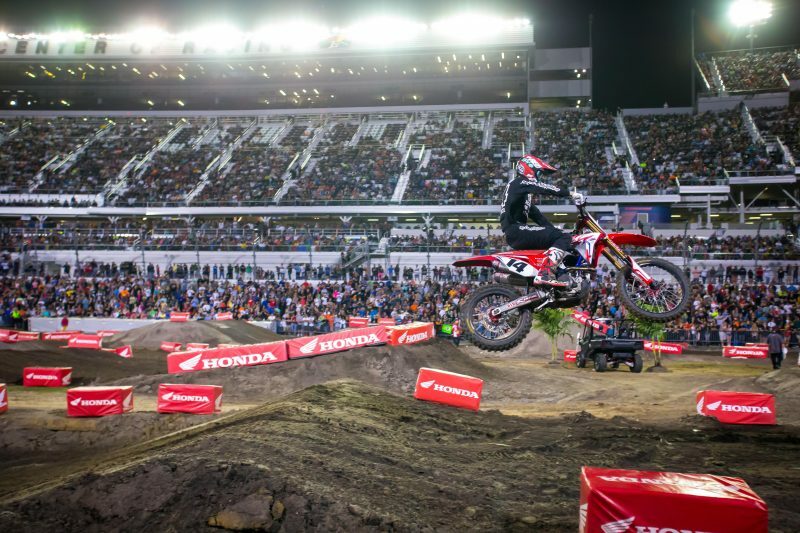 On Friday, Team Honda HRC and GEICO Honda riders participated in the pre-event press day, where they spoke with local media and were given the opportunity to try out a section of the track ahead of Saturday’s race. 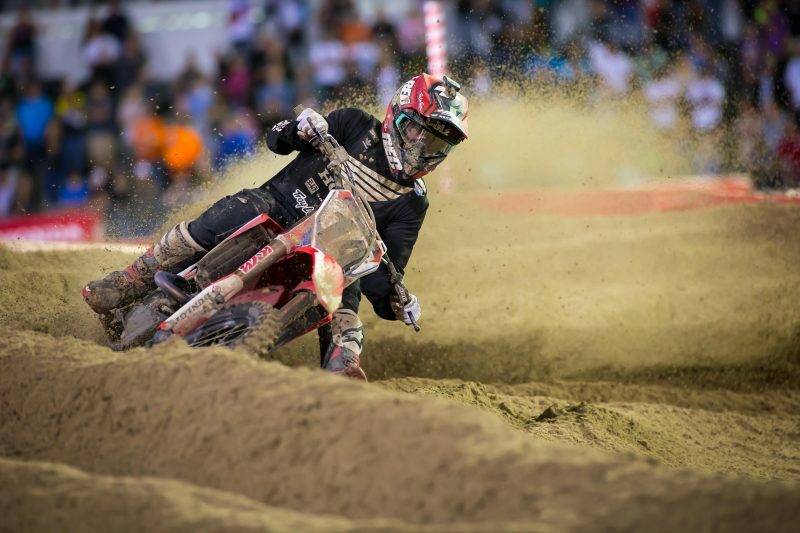 ”Even though they don’t let us ride very long here, it’s still beneficial to be able to preview a part of the track and kind of check out the layout and dirt prior to Saturday. I just wish we could ride a larger section because sometimes I get bored riding the small circle they give us,” Seely laughed. 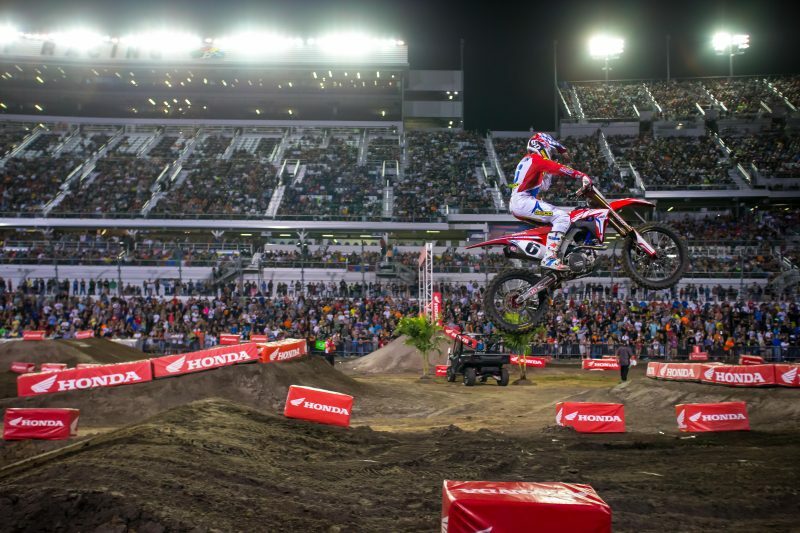 Team Honda HRC provided special access to a group of promotional winners for Daytona International Speedway, organizing a rig tour and opportunity to meet Seely and Roczen prior to the race. The riders signed autographs and took photos with the fans. On race day, Martin worked with both his current GEICO mechanic Richard Sterling, as well as Team Honda HRC support mechanic Jason Thomas. The two divided up tasks throughout the day with Thomas working on the bike and joining Martin on the starting line, while Sterling was in the mechanics area giving out the pit board messages. During the daytime qualifying practice sessions, Martin was also impressive, laying down a 1:11.105 lap in the second session for second fastest, while teammate Seely clocked a 1:11.848 for 8th. 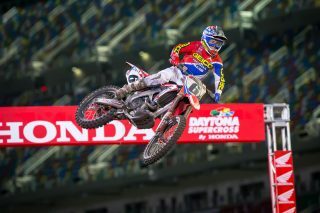 In 450SX heat 1, both Honda riders got off the line to top 10 starts with Martin fifth and Seely eighth. They swapped multiple positions throughout the six-lap race but were ultimately forced to transfer through the semi. 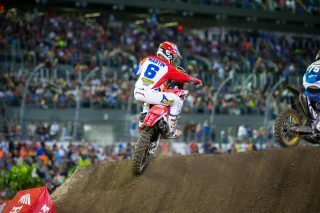 During the semi, Seely took over the early lead and rode to a solid win, while Martin secured a respectable fifth. 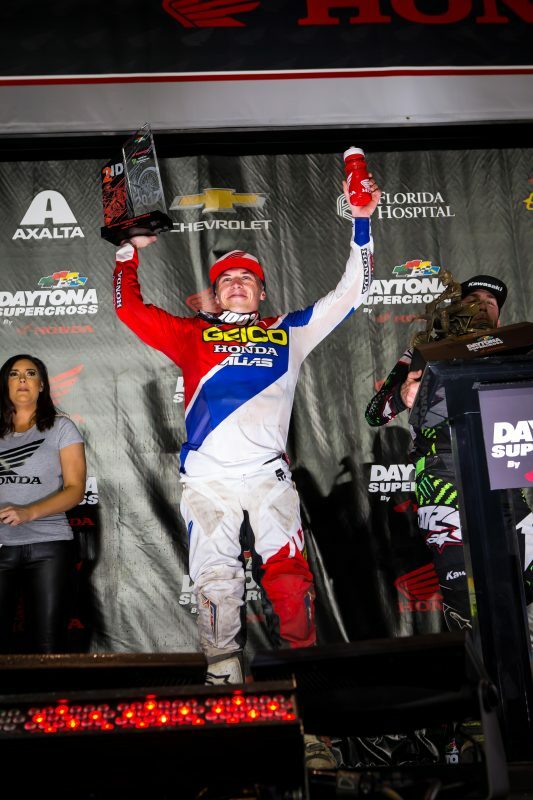 Jeremy Martin’s third-place podium finish marks only the fourth time since 1976 a rider has gotten a podium finish in their first start at Daytona. On Sunday following the race, Honda’s racing endeavors continued 55 miles from Daytona Beach in Palatka where JCR Honda’s Trevor Bollinger competed in the Wild Boar GNCC aboard the all-new CRF450RX. 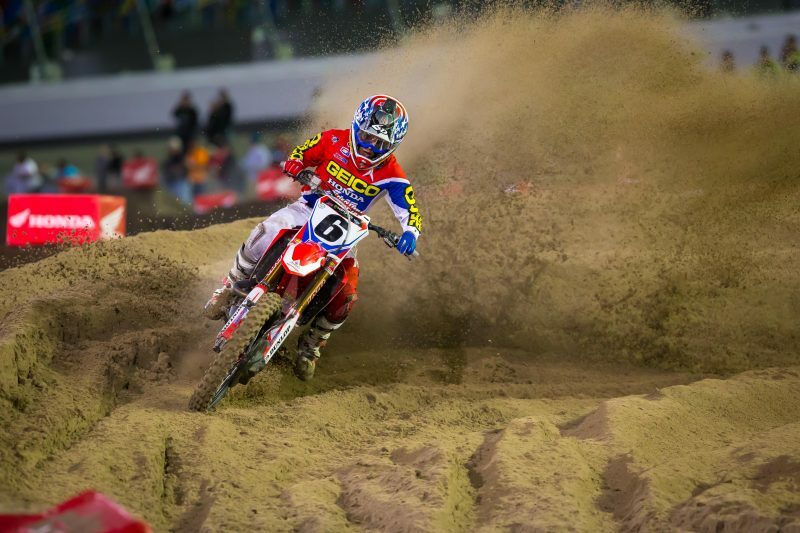 On Saturday, March 18, Team Honda HRC will be in Indianapolis for round 11 of the AMA Supercross series. 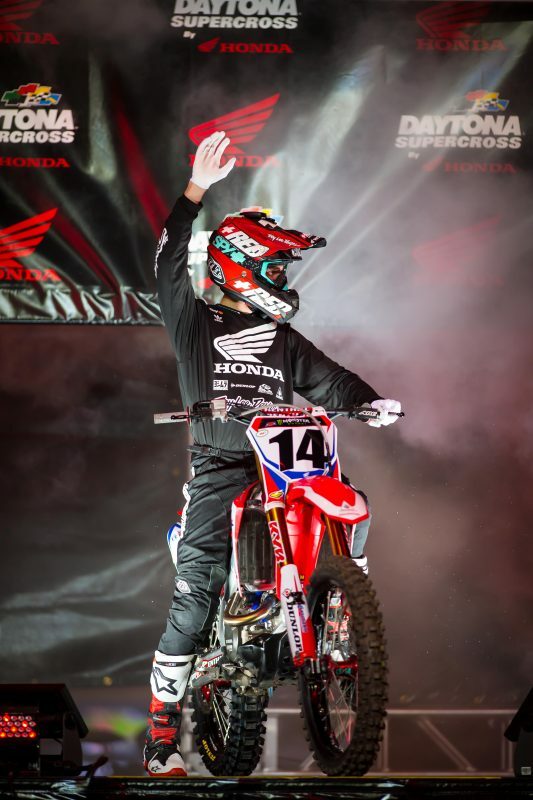 It will be a short week for Seely, as he will head to Indiana early for press activities and an event with team sponsor Honda Performance Development (HPD). 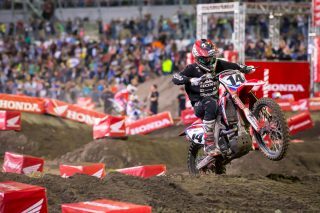 Following the Toronto Supercross, Team Honda HRC riders and crew headed directly to Florida to do some pre-Daytona testing near Clermont. While there, the team also got to spend time with Ken Roczen, who many have not seen since his horrific accident at Anaheim 2. 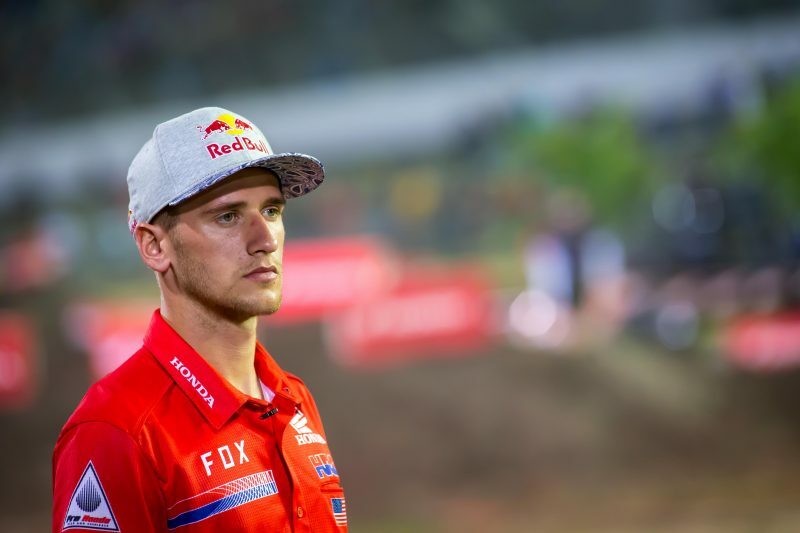 On Tuesday, Roczen hosted the team at his house for a catered dinner and a fun evening. Honestly, I was surprised that I qualified so good. These guys are really fast and they’ve had a lot of experience. I just had a good feeling today. 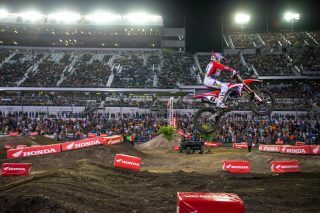 That new Honda is an amazing bike. 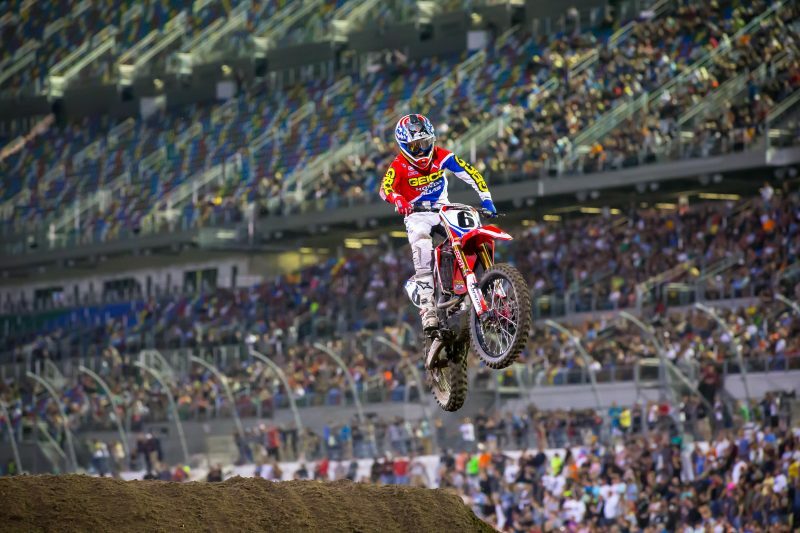 Today was my eighth day on the bike and I’ve really enjoyed it and working with the whole Factory Honda team. The bike’s good. I had 18th gate pick and I was on the outside. I knew I had to do something, so I threw it into the first turn on the outside and I railed the crap out of that berm. Just tried to do my best, but I knew the green machine was coming. To be able to lead, I think it was 10 laps, was just so cool. I have much respect for everyone in the class. I just got a good start and put myself in a good position. Today was all right. There are some positives to take away but a lot of negatives too so I’m a little bummed. I still finished in the top five so that is good but Dungey edged me out on the last lap with only two turns to go so I was almost fourth, which was unfortunate. I made some big mistakes here and there but also hit some pretty bad lapped traffic. It’s so frustrating that those guys just don’t get out of the way sometimes. I really just want to move forward though. I’ve been in the top five or six the past four rounds, which is great and all, but I want to be up front. It’s that plain and simple. I need to start putting myself in a better position off the start. 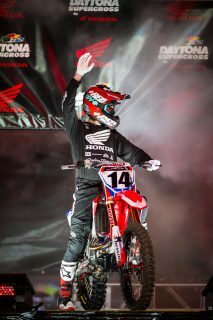 I think Jeremy rode awesome. Our whole goal was to battle with those guys and he did that without giving up. We got him really comfortable on the bike coming into this weekend during our test, which was great. We were right there in the top 10 all day through qualifying then in the last one he put down a great lap for second. I think he got a little excited in the heat – anyone would be during their first 450 race – making some mistakes and sending him to the semi. 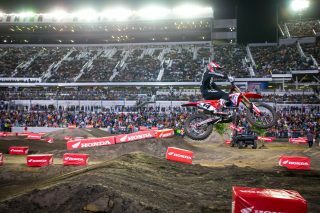 He had a pretty far outside gate for the main event, but he never shut off and came out with the holeshot. It was Jeremy and [Eli] Tomac up front setting the pace, putting almost 20-seconds on third. 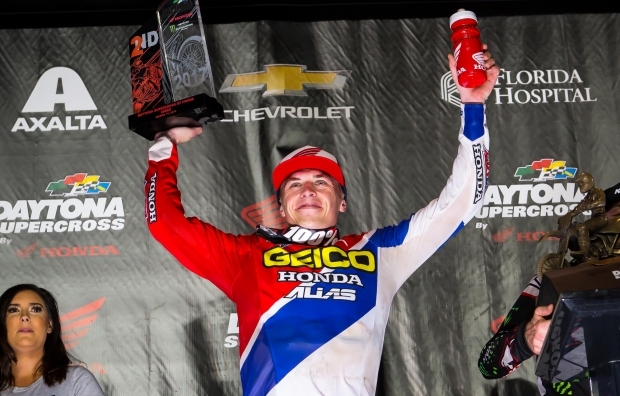 Once Tomac got around him, he just muscled it in for second. This was a great opportunity for him and to be able to bring home a second at Daytona, where Honda is the title sponsor is huge. Positives for tonight are that he moved into third in points, which I’m honestly not too worried about. 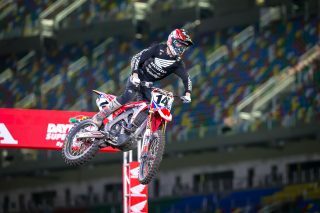 I think he rode okay but was just stuck in the pace of [Justin] Brayton and [Chad] Reed, which was not a very good pace. Even though it was a pretty one-lined track, he could have made passes early in the race. I feel like he just settled in and didn’t put in the sprint effort, which is what we’ve been working on. I guess we need to go back to the drawing table with him and see what we’re missing.